Join us this coming January for the first in our Prophetic Training Days in 2019 from 9am to 3pm at the Crossing Life Church in Windham NH. Join us weekly at 7:30pm on Monday evenings for a time of unified prayer with churches and believers from around our region. Pumpkinfest is our annual event in the Fall (in 2018 it will be on October 6th, 10am-8pm), including a craft fair, live music, concessions, kids games, pumpkin smashing, a bake sale, pie bake off, a martial arts demonstration, bingo, and of course an opportunity to get some PUMPKINS! The celebration is all day and into the evening with bonfires and a truly festive family atmosphere. So mark your calendars for this coming fall (October 6th, 2018) and join us for all the fun! Christmas at the Crossing is our annual holiday celebration which includes a 20-minute wintertime wagon ride, where participants will be able experience the spirit of Christmas and view 45 acres (decorated with scenic Christmas displays) all while hearing the sounds and story of Christmas! Also included are roaring bonfires and marshmallows, a visit with Santa and his helper, craft making for kids, and more! *All is free to the public with the exception of concessions and the purchase of baked goods and gifts. 10 Days is an annual opportunity for the Body of Christ in your area to step away from normal routines of daily life and enter into an extended time of experiencing God together through worship, prayer, fasting, and fellowship. It’s a way for all the believers in your city to unite with Jesus at the center. It’s rooted in the 10 Days between the biblical Feasts of Trumpets and the Day of Atonement. 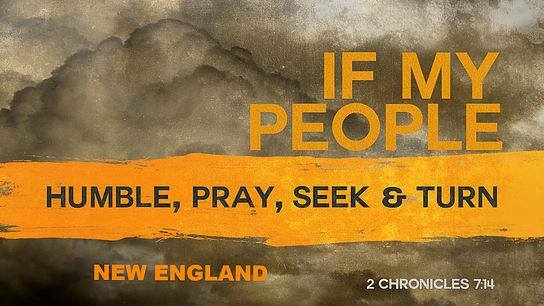 This event, "If My People...New England", is a chance for the body of Christ in this region to come together in worship, prayer and intercession. We are calling on all believers to gather in this place and pray to break strongholds that have been over this land for far too long. Video of Vision & Call to Rally! !